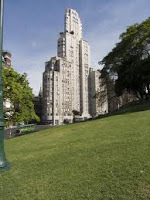 The Plaza San Martín is the entrance gate to this area, distinctive as is the park, for its elegance and tastefulness. 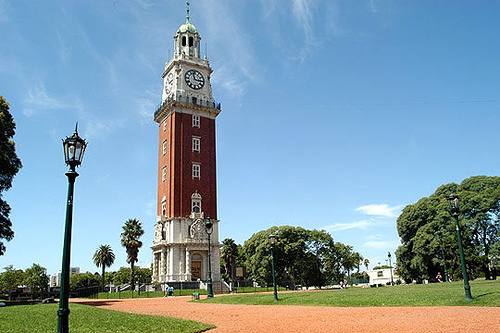 Everything related to luxury and art is gathered in the few blocks that make up the old Retiro neighbourhood. This is why this park, with a hundred uses over its 400 years history, is the chosen spot from which to set out our journey of discovery. At the very begining it was the site for a fort called "La Batería", which served the inhabitants as defense against pirates and corsairs. As early as 1713, the land was purchased by a company in the slave trade; later, a huge bullring that held 10000 spectators was built here. Nevertheless, the most important events to take place here were the battles during the British Invasions. 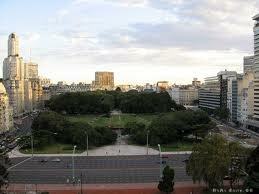 In tribute to this ladmark in history, the park was named "Campo de la Gloria" (Field of Glory). Some time after, it held the barracks of General San Martín´s force "Granaderos a Caballo". In 1878, in memory of the first centennial of the founding father´s birth, the park received its present name. Around it rise sumptuos stylish buildings, which today serve as official branches and classy hotels. Where Florida street is born, international design stores blend with shops dealing in exclusive objects of local manufacture. Beyond, on streets Reconquista and San Martín, a populated bar district, specialising in different beer brands, appears as the best option at sundown, when happy hour blends to perfection with the chance of meeting people. Another of the areas attractions stands on Arroyo street, on which a large variety of art galleries show pieces by renown contemporary artists. In this area, last Friday every month the Gallery Night event is held. On that evening, over 30 galleries stay open well into the night, blending art exhibitions with live music and champagne. Location: Around Plaza San Martín. Main arteries: Santa Fe Ave., Florida, M.T. de Alvear, Arroyo and Juncal. How to get there: Buses 61, 93, 115, 130 and C subway line. Best time to visit: Evening, to make the most of happy hour. Neighbourhood corner: Marcelo T. de Alvear and Florida.